Keep your classroom syncronized between ipads with this very cool app. I want to play more with nearpod. If you have 1:1 ipad programs you should test this app. Another interesting site for recommendations of apps, etc. Edshelf has some very interesting collections. They have collections for school counselors, for creating things, etc. I'm joining and looking into this site for finding cool things. If you like apps, try this site. Take out the trash: get rid of the apps, to do's and activities that clutter your life. Prom will be here tomorrow. It is a circus. No, literally, the theme is “A Night Under the Big Top,” a vintage circus theme that has turned out quite nicel even if I say so myself. Well, sometimes, I've noticed that there is one job that when I ask for it to be done that no one wants to. The troops aren't willing. Since I've asked, only one student in the six times I've asked it, has been willing to take out the trash. I've seen them toy with the trash and move it around a bit in the auditorium, but only one picked up the bags and actually hauled it out. Why is that? Is it because it is beneath them? Is it because it isn't as fun as putting Christmas lights on the stage or as neat as suspending acrobats from the ceiling? Little do they realize that if the trash wasn't out, they wouldn't be able to see those acrobats, lights, or the billowing tent that has consumed the auditorium. The trash would cover it all. Everyone wants a new tool, but who wants to get rid of one that doesn't work? I've been intentionally deleting apps off my ipad and iphone screen of late. If I don't use it, I'll send it into the ether of things that I own but aren't installed on my devices. Like a prom filled with trash, the trash fills up the space that you want to use for something beautiful and useful. So, take out the trash. It isn't glamorous, but it is necessary. Gladly, if you delete an app off your phone or ipad, it isn't permanent. It is still there in uninstalled apps and it can return quickly. When installing a new app, challenge yourself to always delete one you haven't used lately. Cut the clutter and clear your mind. I always keep one empty spot on the homescreen of my iphone. It makes me feel like I have room for more and it is a signal to myself that I will have margin and leave room for new things in my life. There are times, my friends, we have to take out the trash. Not just to have room for more, but to have room to breathe and think. Do we really want our glass full all of the time or do we want to enjoy finishing the glass and being done for a while. Our to do lists, our phones, our computers are all full of more trash than we care to admit. Let's make a commitment today to remove the trash so we can enjoy the circus. Mention gives you 3 alerts for free. Everyone should be following mention of their name and brand names (or school name) it is important. If you want more than 3, you'll have to pay. I use Google Alerts to track flat classroom and cool cat teacher - sad Google Alerts is gone, but here's an alternative. Aurgghh! So Google alerts is dead too. I thought it was just misbehaving. It might have gone on spring break never to unbreak. Oh dear. Here are some alternatives from mashable. Building a digital district. There are some great resources from Edweek on this topic. There is also a PDF or print version of the technology counts 2013 version. This is an example of how you can share lists. Edutopia created a list of the panelists who "hung out" today with the edutopia panel from Finland and the University of Pennsylvania. Excellent group today. Very cool way to get your Kindle notes into evernote. I'm going to try this! I love this trip that is happening in Finland, especially the transparency. I'm going to be "hanging out" with some of those in Finland in the hangout on Wednesday. You can look at what they are doing and how they are traveling and sharing. I think more information-gathering trips should be this transparent. "Doctoral learners from the University of Pennsylvania’s Graduate School of Education will spend a "week in the schools" -- the schools of Helsinki, that is -- looking at a variety of research areas through the lenses of students, teachers, parents and leaders. These lead learners will use that week to reflect upon where the United States and Finland agree and disagree on core beliefs surrounding teaching, learning and leadership." Turning Elementary Computer labs into STEM labs: A welcome change? Recently, elementary STEM lab teacher Kevin Jarrett (@kjarrett) and researcher Dr. Jeremy Irvin (@dr_jeremy_ervin ) spent some time sharing the story of the transformation of an elementary computer lab into a STEM lab at Kevin's school on my podcast.. They are using the curriculum "Engineering is Elementary." What he's doing is powerful and important and I wish every school would follow this model. If you want to subscribe via your podcast app (see my iCatcher tutorial) here's the RSS link to the show. Kevin uses the Engineering is Elementary STEM curriculum. They use Google chromebooks and money from a $3,000 grant to get things set up, but besides that, they didn't really spend much money. As you take time to listen to the show, ask these guiding questions. Does the name "computer lab" restrict what we think we should do in it? Is a STEM lab core or enrichment? How would implementing a STEM lab at the elementary level impact a school? How did it impact Kevins? We need STEM labs not computer labs but remember that the technology is an important component. His kindergartners are using Google Docs and all kinds of technology. If your students transferred to his school, could they keep up? Would they want to go back to your classroom after spending time there? If you're worried with your answers, then, perhaps you should consider being part of the vision of moving forward with STEM in your school. I talked with my curriculum director, headmaster, and a few board members and said if I had one wish for our elementary, it would be a STEM lab for the elementary school. Darren Burris, a math teacher at Boston Collegiate Charter School, has a list of 186 items for Common Core Resources on his Diigo list. He's someone you'll want to follow on Diigo. Fascinating article from a teacher thriving in the standardized testing environment. Fascinating. "Last year, working with the same cohort of students (by then fifth graders), I tried to find more learning opportunities that focused on data. We used math websites like TenMarks that enable students to learn about their own learning even as they practice new skills. We analyzed information graphics and dove into ways of presenting numerical information. We explored how numbers shape our understanding of ourselves and the world. And much of their enthusiasm and curiosity for these tasks came out of their interest in numbers from standardized testing. I've thus come to believe there's a role for standardized testing within education. As a limited portion of a multiple measure evaluation system, it helps teachers understand how well we've taught over the course of a year. It also helps students understand how much they mastered over that year and makes them agents in their own learning." How do you earn a student's trust so learning can start? On Twitter recently, I had a series of conversations between a fictional teacher and his/her student. They got such an incredible response, that I've taken those conversations and captured them here. Hope you allow these 140 character conversations cause you to start thinking. If you decide to write a fictional series like this on Twitter, disclose it. Or others will think that you are writing something based on your classroom RIGHT NOW. Always be transparent. It took a while to learn these things, but teaching starts with a relationship between two people who care. They won't come to the classroom caring about you at all, so you have to start. But once you earn their trust, what you'll experience is a highly rewarding profession where you know you're making a difference. No guilt, teacher. When you see something you're not doing right, start today. You can't live life in the rear view mirror. Get to know the personal interests of students. I've had a personal interest or 20% time project in my classroom since last year. Last year was fantastic. If you want to see what we did, you can look at our wiki. Oddly, some students want me to tell them what to do for their "passion project." We don't settle on a project until I see the sparkle in their eyes. I track all of these projects and activities on the free workflow program, Trello. WARNING: If you don't personalized learning in a face to face environment, someone will find a way less expensive to do it online. We must be personalized learning professionals. You know how sick you are of hearing 21st-century. Just wait, personalized learning is about to be a new buzzword. This one tweet about letting students sleep had more response than any other part of this story. I thought it would be telling to include a few of those responses here. @coolcatteacher this one resonates with me ;) #LetThemSleep sometimes you just know they need itDawn G.
Now. Finally, the time has come. When they finally know you care and trust you, they will let you teach them. It does happen. For some kids it takes a few weeks but most, for me, it takes several months. At some point, if students are honest, they will question the importance of your subject. Even if they like you, this point is critical because you need to take the chance to demonstrate the real-world importance of what you're teaching. You'll hear them say it and you have to take time to cover this. The drawback of scripting, is if you don't have an empowering admin, you can kill the love of learning right here. When students know it has real world applications AND that you love them AND that you'll help them learn - you're a triple threat teacher. Now it happens. They know you care. They know the class is important. Now, they question themselves and if the effort is worth it. Don't give up, you're almost there. You're trained to do this! Show them you know your stuff and help them learn how to learn. You have to leave them with an ability to teach themselves because there are sorry teachers out there. They are lucky you're not one. It often comes back to kids wondering if they matter. They want to feel important. They want to know they are here for a reason. Never forget the human side of what you're doing. You're not feeding data into a machine or shoveling food into a mouth. You are trying to help an organic, trembling brain learn something and it is a lot more complex. Truly, the human mind is the last frontier. When you have this opportunity, be careful. A lesser, more self-centered teacher would get prideful. Pride and arrogance will kill the relationship and your potential for other relationships with students. I take these comments and put them in an "at a girl" file in evernote and treasure them when I have a bad day. This is the second most responded to tweet. Teachers are insecure. Like buying a jewel with all you have, we are spending all we have - our lives - to educate children. Until you've been there, you don't know the joy and the self-doubt that comes from giving everything you have to kids. Teacher, you are important. You are noble. You want the students to believe you when you say they are important. Believe them when they speak kindness to you. It is the least you can do. What 140 character letters would you add to this conversation? Do you stop and solve problems or just whine? Do you solve problems or sit by and whine? The difference is profound. Whiners are like ambulances that never stop. Zipping through neighborhoods of critically ill people - they just whine - pointing out the problem, upsetting the pets, causing everyone to be sleepless - but never doing anything about it. Give me people of action. Give me people who actually put on the brakes, stop the ambulance, triage the problem and take action steps to isolate, remediate, and medicate so there is hope for recovery. Every time you hear an ambulance - ask yourself if you're the siren or the solver who stops to do something. Be the solution, not the waaambulance. I received a message of concern on Tumblr yesterday. This person rightly detected that my writings these days is a twinge of melancholy. Not melancholy of the depression kind but the melancholy born of circumstances that are hard and situations that cannot be explained. So, I thought I would share some thoughts and why I'm still writing anyway. Should I write amidst tragedy? A colleague at school has been struggling with her daughter's sudden illness and subsequent amputation of her legs. It has hit us all so deeply, the entire school has been praying and in heartache. Tragic. Heart ache. In the throes of this, our beloved editor of our local newspaper unexpectedly died of a heart attack. Last week he was singing with the Chamber of Commerce chorale in a black tie and suddenly, this week, he is gone. Tragic. Heartache. And yet, as I read the life of John Newton, author of the surreal hymn, Amazing Grace, that song was much born out of his tumultuous friendship with William Cowper, a clinically depressed, constantly suicidal friend. At one point Newton said he could not write on without his friend. Then, in the next moment, he wrote on, more productive than ever. Perhaps it was amidst the blood of another suicide attempt and the wails of another fit of melancholy that John Newton truly began to understand what grace meant. Should one note write because loved ones suffer? Is it an insult to their injuries that we take time to write? No! Write when your family struggles, for then, too, you may meet with the sublime. Should I write when I'm too busy? Some choose to cocoon, but for me, I write. Combined with these two events (upon which many salty tears have been shed) the prom that is a week from today that I'm organizing, my son graduating and heading to college in a few months, and the money challenges that come with sending him off to college, as well as some surgery I have to have over break to deal with some skin cancer, and a book deadline that whooshed by like the noise of a thousand subway trains, there's a bit on my plate. Not to mention my precious students and all that comes with a classroom. But, I read Michael Hyatt's book Platform and realized that if it is to be, it is up to me. I decided to set my clock for 4 am at least 3 times this week to get up and continue progress on my second book for the modern educator faced with teaching writing in the cloud. Should one not write because life is hard? No! Write when life is hard, then others may feel the reality in your words and be the better for it! Great writers, write. No excuses, they write anyway. Should I not write because I'm afraid I won't finish? Then, I look at the beautiful, haunting poem of Cristabel by Samuel Taylor Coleridge. This beautiful, eerie poem remains unfinished, even though Coleridge would add a Part 2 years after it was written. Coleridge was known as a many with many ideas, who could finish nothing. 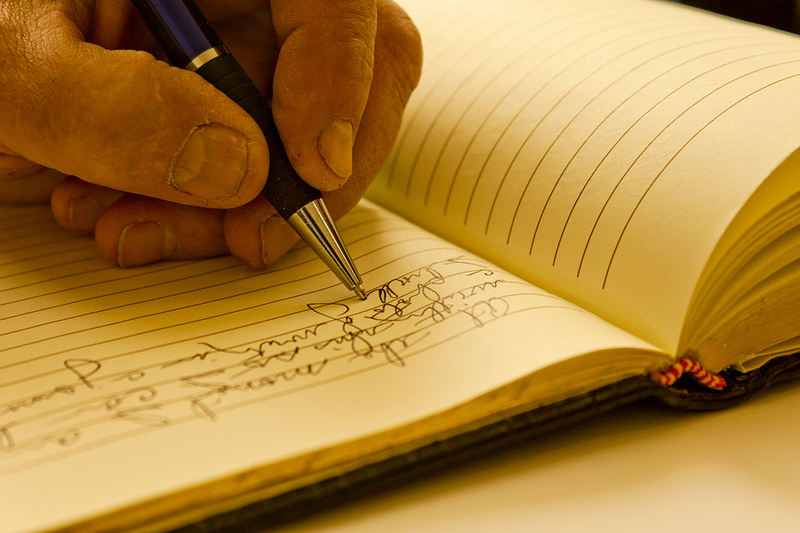 Should one not write because some works will likely remain unfinished? No! Write, even if you might not finish, for those words, even in their unifinished state, might just be the masterpiece the world will need. The juxtaposition of life is often what puts us in a position for enjoying life. While I'll not endorse tragedy or busy-ness or lack of focus as ways to live your life, it is also these things that make life. For after the tart, the sweet tastes sweeter. I don't know about you, but I best identify with authors who have “been there” and “done that.” If they seem to live a perfect life, they are a liar because I've come to understand that life is full of struggle for all humans. So, if you are called to be an author, don't worry about any one else psychoanalyzing you or reading things into your words that just aren't there. Write because you care. Write because you dare. Write because it is what you were born to do. Write on, author, write. If you use Diigo but are researching a certain topic for a book or term paper and also use Evernote, I recommend setting up an ifttt.com recipe similar to this one I'm using for my collaborative writing book. Everything tagged "collaborative writing" goes automatically to my collaborative writing book. You could use this for a course. You could take everything on Diigo tagged with the course number into a notebook (or into a Google spreadsheet, for that matter.) There are many other sources of information you can use to collect information on a topic in one place. In a recent PEW study, National Writing Project (NWP) and Advanced Placement (AP) teachers said that “a top priority in today’s classrooms should be teaching students how to ‘judge the quality of online information.’” Furthermore, teachers are concerned that students don’t get past Google, Wikipedia, and YouTube into deeper (and more accurate) ways of collecting information. If you want to discuss research sources, social bookmarking is the best way to do this. We should see more classrooms using Diigo (the most superior bookmarking service, in my opinion) or Delicious as they discuss and share the documents they will use in their research papers. I’ve found when topics need deeper research or when the sources of research are in dispute, that social bookmarking is the best way to facilitate those discussions. It is a powerful form of pre-writing for students. If they can begin the conversations around research articles and sources, then more accurate information will emerge in their final document. Often students don’t verify the sources of information and should learn to view all online information with skepticism and a critical eye as they converse over what makes a good source. Social bookmarking is a key source of discussion, data collection, and citation in the modern classroom. Take time to read this PEW research about teachers and how they are using technology in their classrooms. It is shocking that 73% say they or their students use cell phones to complete assignments. I wish they had separated out this number to know exactly how many let their STUDENTS use their cell phones. To me, this number shows the tide has turned. Some of the highlights of the research: "Mobile technology has become central to the learning process, with 73% of AP and NWP teachers saying that they and/or their students use their cell phones in the classroom or to complete assignments More than four in ten teachers report the use of e-readers (45%) and tablet computers (43%) in their classrooms or to complete assignments 62% say their school does a “good job” supporting teachers’ efforts to bring digital tools into the learning process, and 68% say their school provides formal training in this area Teachers of low income students, however, are much less likely than teachers of the highest income students to use tablet computers (37% v. 56%) or e-readers (41% v. 55%) in their classrooms and assignments Similarly, just over half (52%) of teachers of upper and upper-middle income students say their students use cell phones to look up information in class, compared with 35% of teachers of the lowest income students"
Your elementary students are overweight? Power Rangers to the rescue! 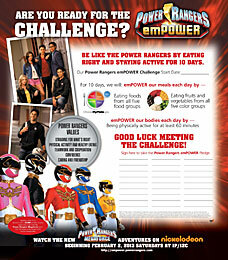 Download the Power Rangers Empower curriculum. Last week when I kept Children’s church, the children said they didn’t want to play “Mother May I” but could they play Power Rangers. Each 4 year old was a ranger and had a job and role to do. Interestingly, when I was approached by a potential advertiser that uses PowerRangers to promote healthy living and habits, I was already primed and keen because I know that children are already play and pretend to be Rangers. This curriculum is perfect for younger children and should be one you email to your elementary teacher friends. You could adapt for other ages as well. The emPOWER program takes the “teamwork, confidence, health, and physical activity” motto’s of the Power Rangers and puts it into a free curriculum for you to use in your classroom. But you can also apply to have the Power Rangers come to your school! The Power Rangers emPOWER Challenge School Sweepstakes will award a $5,000 donation and a visit from the Power Rangers Megaforce to the winning school or nonprofit after-school program. Make sure to download the kit and enter your local elementary school or after-school program in the sweepstakes! Registration is open until March 31st. 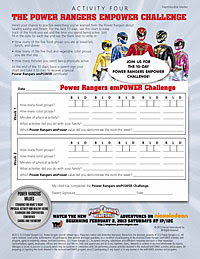 Enter the Power Rangers emPOWER Challenge School Sweepstakes today - and let us know if you've been implementing the program in your classroom how it's worked. The students love the Power Rangers and I am glad they are using their social cred with the younger generation for a good cause. I hope if you’re a teacher in grades 1-3 that you’ll Download the free kit now and tell your friends. You can download each piece separately as well. Thanks. Yes, I’ve accepted this organization for one of the few advertising spots on my blog because I like the program, it is an important cause, and this organization is providing free resources for teachers. That is a great fit. How do you teach students about healthy living? Please share in the comments what you are doing and also, how you like this program. I'd really like to get your feedback. Disclosure of material connection: This is a "sponsored post." It is something I do sometimes for those who are advertisers on my website. (So don't contact me for one unless you want an advertisement.) The company who sponsored it compensated me via a cash payment, gift, or something else of value to write it. Regardless, I only recommend products or services I have used or reviewed personally and believe will be good for my readers. I'm disclosing this in accordance with the Federal Trade Commission's 16 CFR, Part 255: "Guides Concerning the Use of Endorsements and Testimonials in Advertising." Some more interesting ways to edit pictures online. This is an interesting website with cover generators and other tools for you to use to create pictures for your profile. I've been turning tweets that have had the most shares and favorites into photos for two reasons: 1) to test photo makers and 2) to satisfy my own curiosity if it is true that pictures travel further than text these days. Here's one that reached almost 100,000 people on Twitter. The exact tweet was "My wish for children is 1 to 1. Every 1 to have 1 person who loves them. Be the one, teacher. Be the one." Hope this encourages you as you share. Can you spot a hero? We work beside them. They are every where but often blind to the fact that they make such a difference. Heroic people rarely stand at the front of a hall hearing applause. They are watching reruns at night along rocking a colicky baby. They are in a hospital room reading a book to a sick friend. They are all over schools. You. Yes, you. You are misunderstood. Yet you show up to work every day with a smile on your face. You have love in your heart. You have a burning desire to improve the lives of children. Hero. You. Yes, you. The quiet janitor who mops up the mess in the halls. Your meticulous, thankless job probably saves hundreds of illnesses a year. Maybe even a few lives. Hero. You. Yes, you. You are kind even when you're tired. You sort life changing messages from the distractions. You buffer administrators and teachers so they can do their job. Hero. You. Yes, you. You make that deposit faithfully knowing your own bank account is painfully empty. Maybe some think it is not heroic just to be honest. Heroes do the right thing when no one is looking. Hero. You. Yes, you. You could leave early some days but choose to do that maintenance that no one knows about. No one understands what you do. You do the right thing anyway. Hero. You. Yes, you. There are children who love to read today because you took the time to help them find the perfect book. Hero. You. Yes, you. The lunchroom staff who make good food. You take the long way because it tastes better. Your job, when done well, can save thousands of pounds of fat. Maybe a few lives as well. Hero. You. Yes you. The school nurse who hugs the crying child who just got sick. You decide to be personal and close knowing that you might be exposed to something, just because that child needs love. Hero. You. Yes you. The administrator who is pounded on multiple times a day. You still make time to hi-5 kids in the hall. You find encouragement to give others even though you get far too little yourself. Hero. No. There is a difference between having a job and doing a job well. The difference between just being here and being a hero is the "O!" The extra. Just because you work in a school doesn't mean you're a hero. You just have a lot of potential to be one. O! They struggle with depression, recession and the exhaustion of obsession like everyone else. That's because the price of a being a hero is everything. Everything you've got and some you don't. O! Because that is what heroes do… they give all they have in a cause worth giving it for. O! Heroes get tired... bone tired. They wonder if they matter. They cry because they feel like a failure. They wonder if all the things they give up are worth it. They ask themselves if they should just quietly go live on Walden pond alone. You. Hey you. You reading this. Open your eyes wide to the heroes beside. Your thanks and words may just be all that is standing between a hero and the abyss. 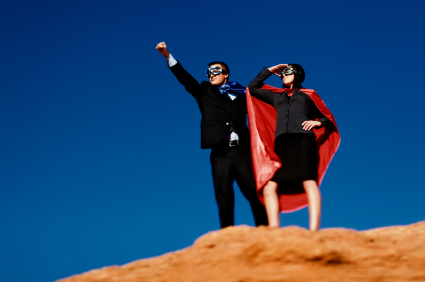 The recognition of heroes is probably the quickest path to being one yourself. Cool. Lots of great blogs her. Some are new to me, but I'm going to be adding them to my (NEW) RSS reader. Just in. Nominate your favorite music teacher for this award!!! "The GRAMMY Foundation® and The Recording Academy® are partnering to present the first-ever Music Educator Award, to recognize music educators for their contributions to our musical landscape. Whether singing in the shower, playing in their college marching band, or performing on the GRAMMY® stage, musicians of all levels have had music teachers that have made a difference in their lives, and this award will acknowledge that contribution. The award is open to current U.S. music teachers from kindergarten through college, and the first annual award will be presented at the Special Merit Awards Ceremony & Nominees Reception in 2014, the night before the GRAMMY Awards®. The Music Educator Award recipient will receive an award and honorarium of $10,000. In addition, nine finalists will also be recognized for their contributions and they will each receive an award and $1,000. Everyone can nominate a teacher – students, parents, friends, colleagues, community members, members of The Recording Academy, school deans and administrators. Teachers are also able to nominate themselves. Once a teacher is nominated, s/he will be notified and encouraged to fill out the complete application. Do you have an educator inspiring students to pursue engineering? Please nominate them! Here's the information. My son is about to pursue engineering and so I have a teacher I will nominate. "Nominations of these teachers in grades 6 to 12 must come from engineers or engineering students. Deadline is March 29; up to three winners will receive a trip to Washington, D.C., a $2,000 cash prize, and classroom supplies. For full details and the nomination form, click here." Teachers can apply for FREE group video calling to use it in the classroom. Many were moving to Google Hangouts because you can use 10 at a time, but now you can do it on skype if you're an educator. APPLY NOW, while you can. I have some sample "Magic erase sheets" in my classroom and LOVE THEM. You can stick them to ANY wall. They make them gridded or plain and they stick everywhere. I've been using dry erase boards but the problem was they wouldn't stick. So, now, I can use these and stick them anywhere. I love them. I'd get a box of sheets and use them in the classroom. Very cool. Due to Google's shortsighted removal of the Google Reader service (showing that the bloggers and content producers of the world don't really matter to them) we all have choices to make. As outlined in this article by Feedly (after they wisely upgraded their servers yesterday), if you set up your Feedly account NOW, and link your Google Reader, it will automatically transition when Google pulls the plug. Why is Google Reader a mistake for Google? Now, for those who are wondering why this is unwise, let me tell you why. They are pulling things that are "unprofitable," however, if they would read Malcolm Gladwell's book "Outliers," they will see that a tiny fraction of people produce a whole lot of the content out there. That tiny fraction is a group that I'm part of as well. When they canned Google Lively, OK, I understood, I really did but even then, it caused me to wonder about what would be next? 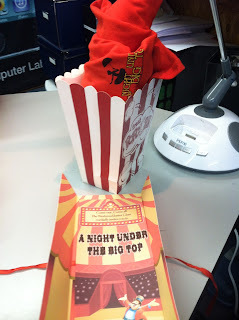 And although my students protested, it was OK. Google Buzz, well that was a fiasco from the beginning but ok, as well. 2 - I predict many will refuse to move to Google Currents out of anger at a company pulling something so important to the livelihood of content producers. I guess they want us to go to Google Currents - their new news service du jour (mobile only, however), but I'm not biting. Why am I going to use and invest all this time in another Google service just to have the rug pulled out? What happens when they don't like how Gmail is working? What happens if Google Drive is no longer making money or they want to charge for it? God forbid that Google Calendar disappear. But really, is this something I want to have in the back of my mind as I increasingly depend on these services? 4 - Does this cast doubt on the advertising model upon which Google is built? While Google needs to make money, I understand that, now that we depend upon the cloud, we might be willing to pay for services that we trust. I pay for Evernote and Dropbox Premium services. It is worth it to me. Honestly, I'd probably pay for Google Reader. But as long as Google has a business model depending upon advertising, they are prone to make shifts in this way. They will make decisions based upon VOLUME instead of focusing on providing exceptional service to just a few customers. The fact is, I can't trust an advertising-driven company to provide ongoing needs for me. I bellied up and paid for an app.net subscription - the pay version of Twitter, although I'm admittedly not on there a lot (not many educators there yet) but I really wonder about this model upon which we've built our webs, lives, and livelihoods. Is it sustainable? Is it prudent? Someone ALWAYS pays. So, I'm planning to see if I can assemble a "pit crew" (as Michael Hyatt calls them) to try to move this blog as seamlessly as possible to my own wordpress. I've already got one configured and tweaked, but I know there are some things I need to do to look more professional and polish things up here. For now, move to Feedly. They've got cred and a beautiful service to boot. Don't wait around hoping that Google will change their mind. They don't and they won't. Meanwhile, I wonder if there is a robust RSS service I can PAY FOR and depend to be there. But then again, the only thing sure in this world is death and taxes and April 15 is around the corner. Goodbye Google Reader. You are a GREAT, FANTASTIC, LIFE CHANGING service. You are a product that my mastery of has built my PLN and completely CHANGED MY LIFE and is helping me pay for college for my children. I'm a stark raving fanatic fan of your service. I adore Google Reader and it is one of the few services I'd probably never ever cancel. I'm that dependent on it. Too bad that Google doesn't realize that sort of loyalty, even from a small group of people, is worth something, especially if those people are content producers and willing to pay to keep it around. "If you don't pay, you have no say." We don't really have a right to complain, because we got it all this time for free. And that, my friends, is the problem. If it is worth it to us, perhaps we should belly up and pay for it ourselves so we don't have to depend upon the fickleness of advertising dollars and the ebb and flow of the economy. I've learned a lot from Google Reader over the years, and perhaps more from losing it than from anything else. Alternatives to Google reader. I just need to find one that has the features to integrate with Mr. Reader and Diigo and do all that I do with it. Oh dear. Very frustrated. This is horrible news to most bloggers I know as many of us use Google reader and the apps that go with it like Mr. Reader and Feedly to pull information out of the web. RSS is one of the most useful features of Web 2 and I'm really unhappy w/ Google. iGoogle was a mistake, this a travesty. Google needs to read outliers and the mavens who use tools. I'll be researching new rss tools. This is ridiculous. ""While the product has a loyal following, over the years usage has declined. So, on July 1, 2013, we will retire Google Reader," Urs Hölzle, SVP Technical Infrastructure wrote. "Users and developers interested in RSS alternatives can export their data, including their subscriptions, with Google Takeout over the course of the next four months."" What does it mean to flatten your classroom?